This page answers some of the more common questions we receive with regards to SimplyPats Version 7 support for the Megger PAT 410, PAT 420 or PAT 450 tester, if you have any questions not covered below please contact support. Are the Megger PAT 400 range of testers compatible with SimplyPats? Yes, SimplyPats Version 7 has support for the Megger PAT 400 range of testers which currently includes the Megger PAT 410, PAT 420 and PAT 450. As far as actual test data is concerned, SimplyPats Version 7 will import all Test Data relating to standard PAT Test Sequences as well as user defined test sequences based on standard PAT related tests. SimplyPats Version 7 can also upload data back to the Megger PAT 400 series of PAT testers. The full Name, Address and other contact details for the company being tested can be entered and stored with each data file created by SimplyPats. While the Megger PAT410, PAT420 and PAT450 allow you to enter the full Name and Address of the company or site being tested, SimplyPats does not import this data directly from the tester. However If you save these details to the SimplyPats Contacts database they will be available from a drop down menu for easy selection in the future. Various options within SimplyPats can be selected at time of import to deal with data entered into the PAT Tester relating to Client, Location and Room ID. How do I transfer Data from my Megger PAT 400 series tester into SimplyPats? The Megger PAT410, PAT420 and PAT450 testers all support export of data to PC (or other compatible hardware device) via USB Memory Stick. 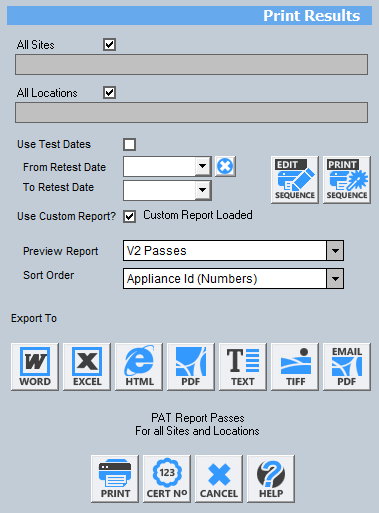 Importing data into SimplyPats from the Megger PAT410, PAT420 or PAT420 is an easy process. 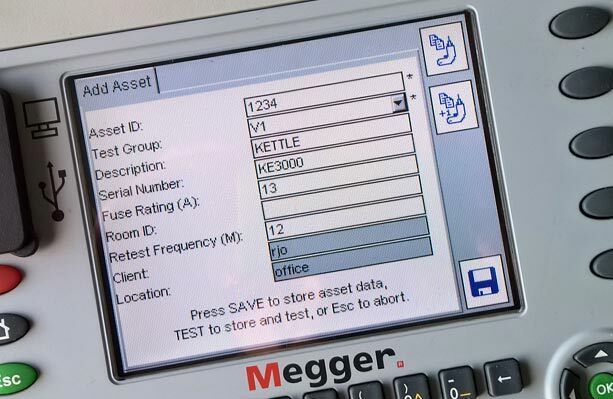 On the Main Screen of the tester select the Data Tab and scroll down and choose "Export Results To USB" Now enter a file name and press OK.
Insert the USB Memory Stick into your PC or device and load the data into SimplyPats via the dedicated Megger PAT 400 Series Import Screen. 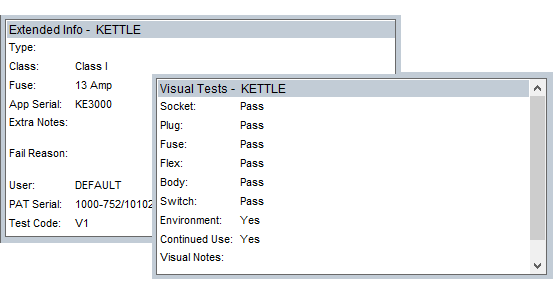 How do i see the actual Test Data for each Appliance? 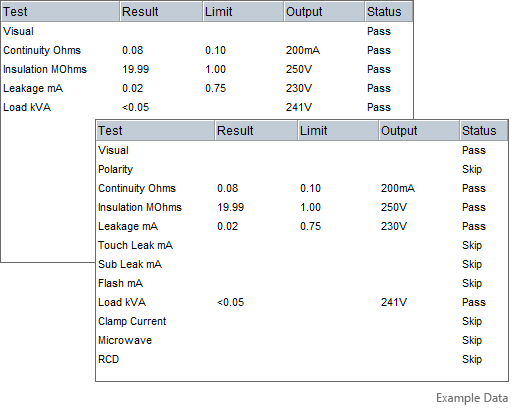 Test Data for each Appliance is clearly shown within the Test Results Pane, on the right hand side of the main screen (shown below). Selecting an Appliance in the Main Grid will show the current Test Results. You can choose to hide skipped tests or those tests not carried out for the selected appliance if you prefer. You can also set any Fails to show in Red. Multiple tests relating to Earth Continuity or Polarity for example will also be shown if your tester is capable of performing this function and if support has been added within SimplyPats to handle this data. In the example above we have not recorded anything in the Room ID field as we only want to record the Site and Location which SimplyPats picks up from the "Client" and "Location" fields on the tester. The Room ID field on the tester could be used to record General Notes, in which case we would need to set the "Use PAT400 Room Id Field for" option on the import screen in SimplyPats to Notes. In this example we are not using this field on the PAT Tester so we will set it to IGNORE. When we import the Megger PAT 400 series Data into SimplyPats information entered into these fields are carried over and stored in the relevant data field (see image below). There is some scope to be creative with the type of data recorded within the Serial Number or Room Id fields; Value of Equipment, Purchase Date or Guarantee Period are just a few examples, either of these could easily be stored into data fields not used within SimplyPats. For more information on this, please contact support. Data related to Visual checks recorded on the Megger PAT 410, PAT 420 or PAT 450 (see image below) are carried over into SimplyPats. When the data is imported into SimplyPats the status for each Visual check will be displayed in the "Visual Tests" data section (see image below). The Fuse Rating if entered will be displayed in the "Extended info" section. 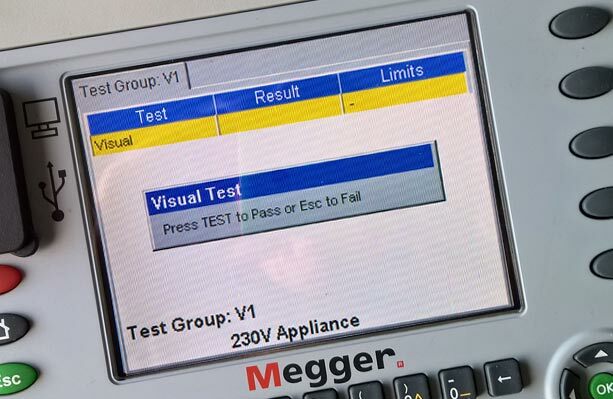 If you have recorded a Visual Fail, the Megger tester will prompt you to select what part of the Visual test you Failed the Appliance on. SimplyPats will pick this up and record a Visual Fail next to the relevant test. Is it easy to Print, create PDF's or Export my PAT Data? Yes, with a data file loaded simply click on the Print Results Icon (or File > Print Results) to bring up the Print Preview Screen. From here you have access to various functionality, export options and available Reports (See image opposite) of which there are over 45 in total. Custom Reports can be designed and are quoted for on an individual basis. A Print Sequence can be setup giving the option to Print and/or Export (to PDF) multiple Reports to multiple printers at the click of a button. Any PDF's created (if selected) can be merged onto one PDF if required, or saved out in seperate PDF's. Yes, SimplyPats can generate Invoices based on Price or Repair Codes entered into your Megger PAT410, PAT420 or PAT450 at time of test (Automatic) or manually via the Invoice Screen. Price and Repair Codes recorded in one of the testers notes fields (for example the Serial Number or Room Id fields if not used) can be carried accross into SimplyPats during the download/import process. 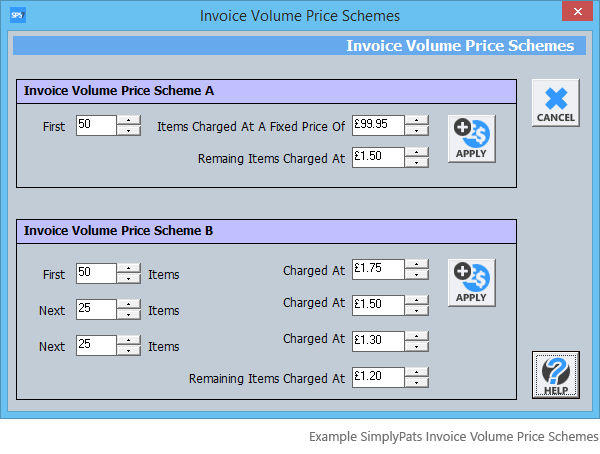 These codes relate to user defined prices held in price schemes and can be managed from within SimplyPats. Up to three Repairs can be entered after the Price Code which can also include the supply of parts such as Flex or Fuses. It may sound complicated but its a really simple system to use once you get used to it. You will also need to designate a spare Notes Field on your Megger PAT410, PAT420 or PAT 450 tester to record this type of information if you want to use this feature. If you are not recording PAT Testing Price or Repair Codes on your Megger tester you can still manually generate PAT Testing Invoices based on an Overall Fixed Price, or setup Price Schemes based on number of PAT Tests. You can even add your own chargable services such as Travel to Site or Hourly Rate, discounts can also be applied. Can the PAT Data from my Megger PAT410, PAT 420 or PAT 450 be merged into data from other PAT testers. Yes, data from any of the supported PAT Testers available in SimplyPats can be imported or merged into the same data file if needed. It may be worth pointing out that data downloaded from one PAT tester may not be compatible for upload to another PAT Tester. SimplyPats PAT Testing Software for the Megger PAT410, PAT420 and PAT450. If you are looking for PAT Testing Software for your Megger PAT 410, PAT 420 or PAT 450, the full Downloading Edition of SimplyPats will help you manage all aspects of the PAT testing proceedure while producing professional Electrical Safety and Inspection Test Reports and Certificates. 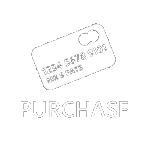 Click here to purchase SimplyPats.